According to media reports, the American people has just held the "national coming out day", has sparked the for gay people, bisexual people and transgender community's attention. Facebook has just reported that over the past year about 800000 americans on Facebook "coming out". Although traditional "coming out" refers to a person take the initiative to disclose their sexual orientation or gender identity, but in order to facilitate study, Facebook on the slight adjustment: the company called "coming out", refers to update my personal data to express attracted to, or use a social network of custom tools to better express their gender identity. Facebook, according to the above definition of the company after the user estimates that over the past year about 800000 americans on Facebook "coming out". 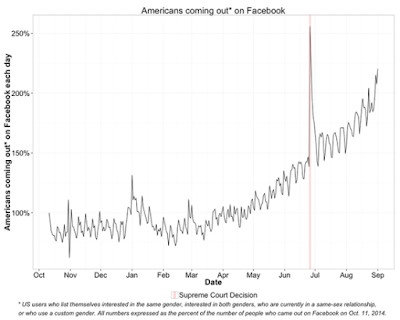 Total, a total of more than 600 americans on Facebook "coming out", of which 78% occurred in the past three years. In fact, the Supreme Court of the United States to legalize gay marriage also has a significant impact on the trend: just released in the ruling period, there are more than 2600 americans choose to add a rainbow on his head, there are 5.7 million people in the United States joined at least 5.7 million of the most popular one of LGBT page, rose nearly 25%.